Isobutanol is an important substance for industry. No known organism can produce isobutanol or other branched-chain alcohols. Atsumi et al. presented a metabolic pathway to produce isobutanol in Escherichia coli. The pathway is shown in Figure 1. As we want to integrate this pathway in E.coli we used and improved existing BioBricks from the iGEM team NCTU Formosa 2011/2012. We used gene coding sequences of four out of five required proteins for the isobutanol production. The coding sequence of the gene of Adh (alcohol dehydrogenase), the fifth required protein, was not available as a BioBrick but because of E.coli's own AdhE the pathway works (Atsumi et al., 2008). As you can see in Figure 2 we have two approaches for our producing system. Figure 2: Schematic illustration of our isobutanol constructs. We want to reproduce the pathway from iGEM team NCTU Formosa without their temperature system (BBa_K887002). 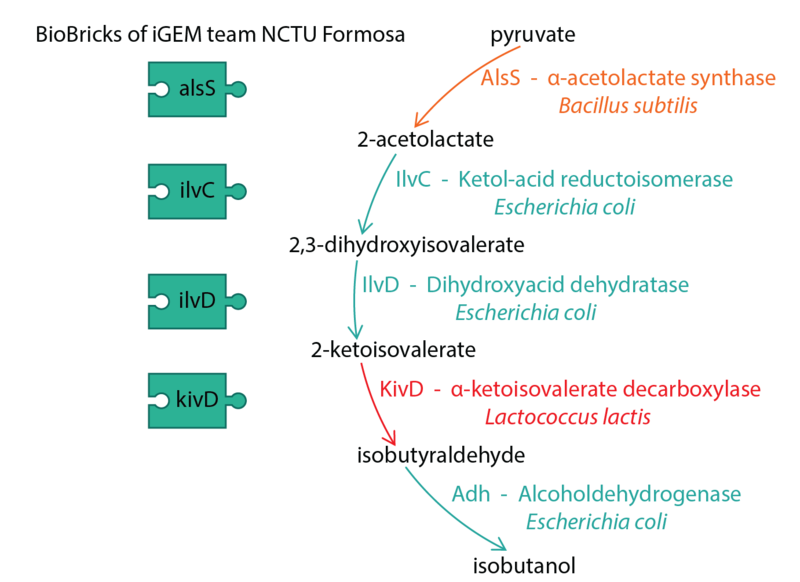 In their system the first three proteins (AlsS, IlvC and IlvD) were generated while E.coli is incubated in a 37°C environment. During this the non-toxic intermediate 2-ketoisovalerate is accumulated. By shifting the temperature to a 30°C environment the missing KivD can be generated because of the non-active repressor. Together with the AdhE from E. coli KivD converts 2-ketoisovalerate into isobutanol. In Figure 2A you can find our first approach where we also used the AdhE from E. coli. We disclaim the temperature system and put all coding sequences in a row behind a promoter separated by the RBS in front of each gene. We used Gibson as the cloning method for the part BBa_K1465302. For cloning the ptac upstream the part BBa_K1465302, the prefix insertion BioBrick assembly was used. This idea resulted in the part BBa_K1465306. We found out, that the AdhA from L. Lactis is the best alcohol dehydrogenase in literature (Atsumi et al., 2010). We wanted to increase the production of isobutanol by cloning the adhA gene downstream of our producing pathway. By Gibson we designed a new part (BBa_K1465301) which contains the coding sequence of the adhA gene from L. Lactis and is combined with the RBS BBa_B0034. Afterwards we did several BioBrick assemblies for combining the parts BBa_K731500, BBa_K1465302 and BBa_K1465302. You can find a schematic illustration of our created BioBrick BBa_K1465307 in Figure 2B. In the following section you will find some information about the five proteins involved in the isobutanol production. We took the coding sequence of the gene of the α-acetolactate synthase (AlsS) from B. subtilis from the BioBrick BBa_K539627. This protein is responsible for the conversion of pyruvate into 2-acetolactate (Figure 1). We took the coding sequence of the gene of the ketol-acid reductoisomerase (IlvC) from E. coli (BBa_K539621). This protein converts 2-acetolactate into 2,3-dihydroxyisovalerate (Figure 1). We took the coding sequence of the gene of the dihydroxyacid dehydratase (IlvD) from E. coli from BBa_K539626. This protein is responsible for the conversion of of 2,3-dihydroxyisovalerate into 2-ketoisovalerate (Figure 1). We took the coding sequence of the gene of the α-ketoisovalerate decarboxylase (KivD) from L. lactis from BBa_K539742. This protein catalyzes the reaction from 2-ketoisovalerate into isobutyraldehyde (Figure 1). We designed a new part which contains the coding sequence of the adhA gene from L. Lactis (BBa_K1465301). This protein is responsible for the conversion of isobutyraldehyde into isobutanol (Figure 1). Atsumi S, Hanai T, Liao JC., 2008. Non-fermentative pathways for synthesis of branched-chain higher alcohols as biofuels. In: Nature 451, 86–89.